Next to the various sprinting workouts and weight room exercises, the most controversial topic is sprint drills or speed drills. Why do you do them? What is the purpose? For my athletes, I use sprint drills as part of the dynamic warm up, but also as reminder for cues. Of course, marching with funky movements at 1 meter per second will never translate to sprinting at 10 or 12 meters per second. But hopefully the cues will result in a hind brain activity and there be automatic when it counts! After all, that’s why we do all those dorsiflex drills, right? But a careful eye during the drills can tell you if the athlete is 100% with no restrictive range of motion. If you see something wrong in the drills, STOP! As a track and field coach it is difficult pin down the things that your belief makes your program special. As a coach I believe our work with biomechanics, something that I believe we can hang our hat on. Interestingly enough, a lot has been written about the effectiveness of drills. But I also believe the devil is in the details. Everyone discusses A skips, B skips, and quick leg type drills. We of course use those drills but it is also important to play with the surfaces, hand position, loaded or unloaded, straight, curve, hill, and flat. We also try to combined drills and skills. Now you may be asking what is the value of drills beyond warm up and rehab? I believe at Maximum velocity it is extremely important to protect the firing pattern of the hamstring. The speed and forces these athletes put their bodies through its opens them to all sorts of risks. Another value of these drills is it helps at the diagnostic level to catch issues before the main part of the workout begins. I can’t tell you how many times I have been able to pull a kid out of practice before a drastic injury. It has worked to this point for a number of years as we have not had a hamstring pull in five years (yes I just knocked on some wood). The magic is to first package your drills in two day rotations. That will help you keep things fresh for your kids and keep them from overloading certain muscle groups. Then every two weeks those packages of drills should change and build previous skills. For example go from a walking quick leg, to a jogging quick leg, alternating quick leg, double quick leg, quick ankles to a quick leg, and on on. If possible the drill packages should mimic your themes for that particular Microcycle. Using drills to correct inadequate technique take a long time. Recently I was reviewing a number of clinic videos from 2004 USATF Super clinics and one of the presenters mentioned a study that said it takes upwards to 500 hours to correct bad technique. If you start with an athlete their freshman year things can be changed. Obviously, it takes commitment to the process and constant queuing from the coach of years. Reading Ralph Mann’s recent book The Mechanics of Sprinting and Hurdling , the best difference in all his charts and data between elite to novice is front side mechanics. As coaches its our duty to not ignore that information as just talent being talented. Change can happen. It’s time to get to work. Enclosed below I included a video of some of the drill packages we do at PCH and the St. Louis Lightning. Please recognize the athletes doing these drills are at different stages in development. In addition I show some of the slight variations that you can use to slightly change your drills and make things more technically challenging. 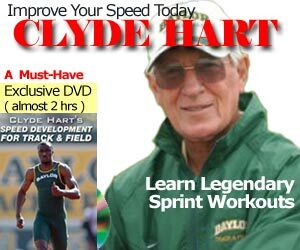 Here is a sample of some sprint drills on YouTube. He has a new book coming out (Summer 2013) titled Sprinter’s Compendium, a “one stop shop” for theory and practical information for any coach looking for real world strategies to improve sprint training for any type of athlete. Really great post Jim. Concerning the harmstring issue I think skip for distance can be effective. The radial speed of the thigh being higher when you skip for distance than when running at full speed. Maybe you can comment on that. It’s funny to see that we all do the same kind of drills everywhere in the world and how similar the kids we coach are. Fabien we do skip for distance. In my book this summer I talk about plyometric work. Skips for distance have a place in our program but they are built into our program after a number of jump activities have already been put in place. The Dan Pfaff progression with Plyometrics is a great one! I cut out all drills for my athletes. No injuries. Warm up is skipping for two laps. I think athletes pick up more bad habits then good from drills. @adarian, I still remember Stu McMillan saying David Rudisha’s warm up before his London 800m was a 40 minute jog. No drills, no strides… just jog 40 minutes. We do a series of skips, hops, and mini sprints as our general warm up then different stretching routines depending on the day before our running drills. Again we have ran very fast from the 100-5000 at PCH without major injury. Again the details are important.